Genomic analysis of a metronidazole resistant H. bizzozeronii strain revealed a frame length extension of the oxygen-insensitive NAD(P)H-nitroreductase HBZC1_00960 (RdxA), associated with the disruption of the C-terminal cysteine-containing conserved region (IACLXALGK). This was the result of the extension (from C8 to C9) of a simple sequence cytosine repeat (SSCR) located in the 3’ of the gene. A 3' SSCR is also present in the rdxA homolog of H. heilmannii sensu stricto, but not in H. pylori. We showed that in the majority of in vitro spontaneous H. bizzozeronii metronidazole resistant mutants, the extension of the 3′ SSCR of rdxA was the only mutation observed. In addition, we observed that H. bizzozeronii ΔrdxA mutant strain showed the same MIC value of metronidazole observed in the spontaneous mutants. These data indicate that loss of function mutations in rdxA and in particular the disruption of the conserved region IACLXALGK is associated with reduced susceptibility to metronidazole in H. bizzozeronii. Slipped-strand mispairing of the SSCR located in the 3′ of the H. bizzozeronii rdxA appears to be the main mechanism. We also observed that H. bizzozeronii acquires resistance to metronidazole at high mutation rate, and that serial passages in vitro without selection induced an increased level of susceptibility. In conclusion, contrary to what was previously described in H. pylori, the H. bizzozeronii rdxA appears to be a contingency gene which undergoes phase variation. The contingency nature of rdxA should be carefully considered when metronidazole is used in the treatment of H. heilmannii-associated gastritis. The human-adapted pathogen Helicobacter pylori is one of the most common causes of bacterial infections worldwide, and it is recognized as an etiologic agent of chronic gastritis, peptic ulcers, gastric adenocarcinoma and MALT lymphoma. Humans can also be sporadically infected by non-H. pylori gastric Helicobacter species, referred to as H. heilmannii sensu lato, that are also able to cause gastritis. H. heilmannii s.l. comprises very fastidious zoonotic Helicobacter species, including H. bizzozeronii, H. felis, H. suis and H. heilmannii sensu stricto, which are all known to colonize the gastric mucosa of different animal species. Although the absence of a simple laboratory test have lead to an underestimation of the infection rate, H. heilmannii s.l. is consider to be a rare type of zoonosis, with prevalence ranging between 0.2% and 6.5% depending of the geographic region[2–5]. Due to the rarity of these infections and the peculiar growth requirements of H. heilmannii s.l., which limits the isolation of pure cultures, very little is known about the prevalence of antibiotic resistance in these species[6–9]. Therefore, the optimal treatment regimen for these infections remains unclear, and conventional H. pylori eradication treatment is generally recommended[10, 11]. The standard treatment for H. pylori appears to eradicate H. heilmannii s.l. infection in most patients[3, 5, 10–13]. However, cases of failed treatment have been reported[7, 14]. The peculiar growth requirements of H. heilmannii s.l. have limited the application of molecular tools, affecting studies on the molecular mechanisms of antibiotic resistance in these species and hampering the adoption of new, specific strategies to treat patients after a failed treatment. To better understand the molecular mechanisms of antibiotic resistance in H. heilmannii s.l., we investigated the potential reasons behind the failed treatment of a H. bizzozeronii infection in a 47 year-old woman suffering with chronic gastritis. A few months after the diagnosis of H. bizzozeronii-associated gastritis, the patient was treated with a seven-day course of lansoprazole 30 mg twice daily, tetracycline 500 mg four times daily and metronidazole 400 mg three times daily. After the treatment, the patient’s symptoms became less severe and the patient started to gain weight. However, she continued to suffer from mild nausea associated with eating warm foods, and, after a few months, H. bizzozeronii was re-isolated from antrum samples obtained in a follow-up endoscopy. The H. bizzozeronii obtained before the treatment was resistant to tetracycline, but a heterogeneous resistance profile for metronidazole was observed. In fact, H. bizzozeronii CIII-1ORG (an isolate obtained from the corpus of the patient‘s stomach before the treatment) showed an MIC of metronidazole equal to 32 μg/mL, but the MIC value for its derived clone CIII-1GEN, obtained by amplification of a single colony, was 4 μg/mL. These data indicated the simultaneous presence of metronidazole susceptible and resistant H. bizzozeronii variants before the treatment. After treatment, the isolated H. bizzozeronii (antrum T1) was resistant to both drugs. Metronidazole is considered a prodrug whose activation requires intracellular reduction by anaerobic or microaerobic microorganisms; this results in the production of bactericidal cytotoxic radicals[16, 17]. In H. pylori the main causes of metronidazole resistance are mutations inactivating two nitroreducate genes: rdxA and frxA[16, 17]. However conflicting evidence correlating the oxygen-insensitive nitroreductase RdxA and/or the NAD(P)H flavin oxidoreductase FrxA with the resistant phenotype, indicate that the molecular basis of resistance in this species remains unclear[16, 17]. A comparative genomic analysis of the H. bizzozeronii isolates obtained before and after the treatment showed that, among the five putative nitroreductases identified in the genome of H. bizzozeronii CIII-1GEN, only the oxygen-insensitive NAD(P)H-nitroreductase HBZC1_00960, showing 47% identity with H. pylori RdxA HP0954, was affected. This study investigates the role of HBZC1_00960 (H. bizzozeronii RdxA homolog) in the molecular mechanisms of metronidazole resistance in H. bizzozeronii. For this study, the human-derived H. bizzozeronii strain CIII-1GEN, which exhibited a metronidazole MIC of 4 μg/mL, was selected[7, 15]. In addition, the canine-derived H. bizzozeronii CCUG 35545T strain (MIC = 8 μg/mL) was used for the mutation analysis. Helicobacter spp. strains were cultured on HP agar plates (LabM Limited, Lancashire, UK) as previously described. For electroporation, H. bizzozeronii strains were cultivated in liquid media constituted by Brain Heart Infusion (BHI, BD, Becton, Dickinson and Co., NJ, USA) containing 10% Fetal Bovine Serum (Gibco®, Invitrogen Carlsbad, CA, USA), Skirrow selective supplement (Oxoid Ltd., Cambridge, UK) and Vitox supplement (Oxoid) (BHI-FBv) at 37°C in a jar with microaerobic atmosphere supplemented with hydrogen. The E. coli TOPO10 strain (Invitrogen Corporation, Carlsbad, CA, USA) was cultivated on Luria-Bertani (LB) agar or broth supplemented with 100 μg/mL ampicillin or 10 μg/mL chloramphenicol when needed. The H. bizzozeronii genomic DNA was prepared as previously described. PCRs were performed in 25 μL reactions using Phusion® High-Fidelity DNA Polymerase (Finnzymes, Oy, Espoo, Finland) and 25 pmol of primers (Table 1). The minimum inhibitory concentration (MIC) value of metronidazole (Sigma-Aldrich) was estimated using the agar dilution method. Briefly, HP agar plates supplemented with serial dilutions of the antibiotics were inoculated with 10 μL bacterial inoculums (corresponding to approximately 103 cfu). The inoculum was prepared by diluting (1:10) a 0.6-0.8 OD600 bacterial suspension obtained from 4 days’ culture on HP agar plates. The plates were incubated at 37°C in the microaerobic incubator. The MIC values were determined by three independent assays after 4 and 6 days of incubation. H. bizzozeronii CIII-1GEN (MIC = 4 μg/mL) was used as reference control. The EUCAST 2012 clinical breakpoint of metronidazole (> 8 μg/mL) described for H. pylori was used to classify H. bizzozeronii as either resistant or susceptible. Spontaneous metronidazole-resistant H. bizzozeronii mutants were selected by a single passage in media containing four times the MIC of metronidazole. Briefly, a suspension containing approximately 106 cfu/mL of 3-day-grown H. bizzozeronii CIII-1GEN was prepared in BHI-Fbv and cultured in biphasic medium (HP coupled with BHI-Fbv) for 36 h. Then, 100 μL was spread onto HP agar plates containing 16 μg/mL of metronidazole. After six to ten days of incubation, resistant colonies were picked up and transferred to a new HP plate containing 16 μg/mL of metronidazole before being frozen at −70°C in 10% glycerol for further use. From each mutant, HBZC1_00960 was amplified and sequenced. The experiment was repeated three times. Chromosomal inactivation of the HBZC1_00960 gene (H. bizzozeronii rdxA homolog) was performed by allelic exchange using the chloramphenicol resistance gene (cat), as previously described. The cat gene was introduced in the same direction as the target gene using Xba I and Kpn I restriction sites. The resultant plasmid, pCP5, was constructed and amplified in E. coli TOPO10 and used as a suicide plasmid in H. bizzozeronii. Mutants were obtained by electroporation as described for H. felis. After electroporation, the bacteria were left to recover on HP agar plates for 48 h under microaerobic conditions. The mutant strains (H. bizzozeronii rdxA::cat) were selected on HP agar plates supplemented with chloramphenicol (10 mg/mL). The plates were incubated up to 10 days, and the site of recombination was verified by PCR. The mutation rate and frequency of H. bizzozeronii for metronidazole were calculated using Luria-Delbrück fluctuation analysis. Briefly, from a three days’ culture, a suspension of approximately 106 H. bizzozeronii CIII-1GEN per mL was prepared in BHI-Fbv broth and divided into twenty-four 0.5 mL aliquots. These aliquots were allowed to grow in biphasic medium (HP coupled with BHI-Fbv) for 36 h to obtain parallel, independent cultures. The number of resistant mutants that emerged in each culture was determined by plating an aliquot of the culture on HP agar plates containing 16 μg/mL metronidazole. The total number of cells (Nt) was determined by plating an appropriate dilution of three cultures on non-selective medium. Colonies on both selective and non-selective plates were counted after a maximum of 10 days of incubation. The frequency of resistant mutants was expressed as the mean number of resistant cells divided by the total number of viable cells per culture. For the calculation of the mutation rate, the most likely number of mutations per culture observed (mobs) was first calculated from the distribution of numbers of resistant mutants in the independent cultures by the Ma-Sandri-Sarkar maximum-likelihood method using the FALCOR web tool. The effect of the sampling in the calculation of the most likely number of mutations was corrected for by applying the following equation: m act = m obs z − 1 z ln z , where z is the fraction of culture plated. Then, the mutation rate (μ) per cell division was calculated as: μ = m act N t , where Nt is the total cell number per culture. H. bizzozeronii strain CIII-1GEN and its derivate CIII-1GEN ΔrdxA and CIII-1GEN M11 (spontaneous metronidazole resistant mutant) were sequentially sub-cultivated. CIII-1GEN was maintained on non-selective plates, CIII-1GENrdxA::cat was maintained in the presence of 16 μg/mL of metronidazole, and CIII-1GEN M11 was maintained in both conditions. After 10, 12 and 15 passages, approximately 108 cells/mL of each H. bizzozeronii strain were suspended in BHI-Fbv with or without 32 μg/mL of metronidazole. After 16 h, the intracellular ATP levels were measured using BacTiter-GloTM (Promega). The experiment was performed in duplicate. The data were analyzed as percentage of relative light units (RLU) of the treated samples compared to the untreated ones. The statistical analysis was performed by applying One-way ANOVA analysis of variance followed by Tukey‘s Multiple Comparison using GraphPad Prism version 4.03 for Windows (GraphPad Software, San Diego, California, USA). A multialignment of the C-terminal part of the amino acid sequence of the RdxA homologs of H. bizzozeronii CIII-1GEN (HBZC1_00960) and of several other Helicobacter species with the predicted RdxA amino acid sequence of the resistant variant H. bizzozeronii Antrum T1 is shown in Figure 1. 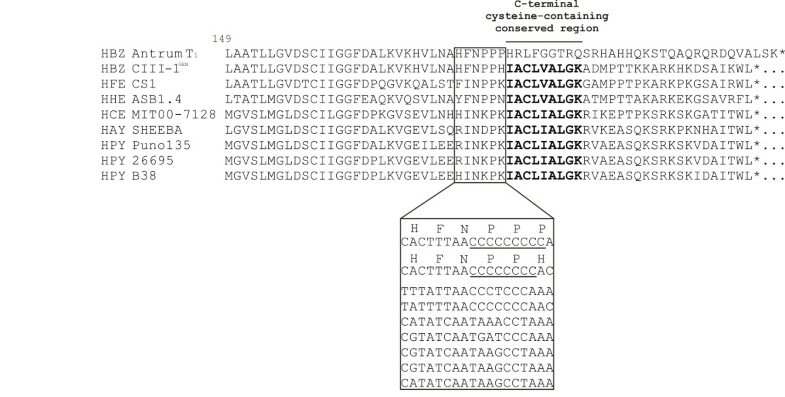 As compared to the isogenic strain CIII-1GEN, the resistant H. bizzozeronii variant Antrum T1 showed a frame length extension leading to the disruption of the C-terminal cysteine-containing conserved region IACLXALGK (amino acids from position 182 to position 190 of HBZC1_00960) in the RdxA homolog. The frame length extension was a result of the insertion of a single cytosine in a homopolymeric run located in the C-terminal of H. bizzozeronii rdxA (from codon 178 to codon 180 of HBZC1_00960). A 3' simple sequence cytosine repeat (SSCR) was also present in the same position in the rdxA of the H. heilmannii s.s. type strain but not in other gastric Helicobacter species (Figure 1). To verify whether the instability of the 3’ SSCR of H. bizzozeronii rdxA was associated with metronidazole resistance, the rdxA genes of 11 metronidazole-resistant H. bizzozeronii CIII-1GEN isogenic spontaneous mutants were sequenced. All of the isogenic mutants obtained in three independent experiments showed a MIC of 32 μg/mL (eight-fold more than the MIC described for the parental strain). In 10 out of 11 mutants, the extension of the SSCR (C8 to C9) in position 178–180 was the only modification observed in rdxA. However, the M9 mutant contained a single base deletion upstream of the SSCR, which induced the formation of a premature stop-codon in RdxA, and extension of the SSCR was not observed (Table 2). Multialignment of the predicted amino acid sequences of RdxA C-termini from different Helicobacter spp. The area where the simple sequence cysteine repeat is located in H. bizzozeronii is highlighted, and a multialignment of the corresponding nucleotide sequences is shown. The C-terminal cysteine-containing conserved region is marked in bold. HBZ Antrum T1: H. bizzozeronii metronidazole resistant strain (MIC 32 μg/mL); HBZ CIII-1GEN: H. bizzozeronii isogenic metronidazole susceptible strain (MIC 4 μg/mL); HFE CS1: H. felis CS1T (Hfelis_12350); HHE ASB1.4: H. heilmannii sensu stricto ASB1.4 T (CCM10903); HCE MIT00-7128: H. cetorum MIT00-7128 (HCw_05595); HAY SHEEBA: H. acinonychis strain Scheeba (Hac_1030); HPY Puno135: H. pylori Puno135 (HPPN135_04725); HPY 26695: H. pylori 26695 (HP0954); HPY B38: H. pylori B38 (HELPY_0940). The length of the 3′ SSCR and mutations in rdxA are indicated for each strain. 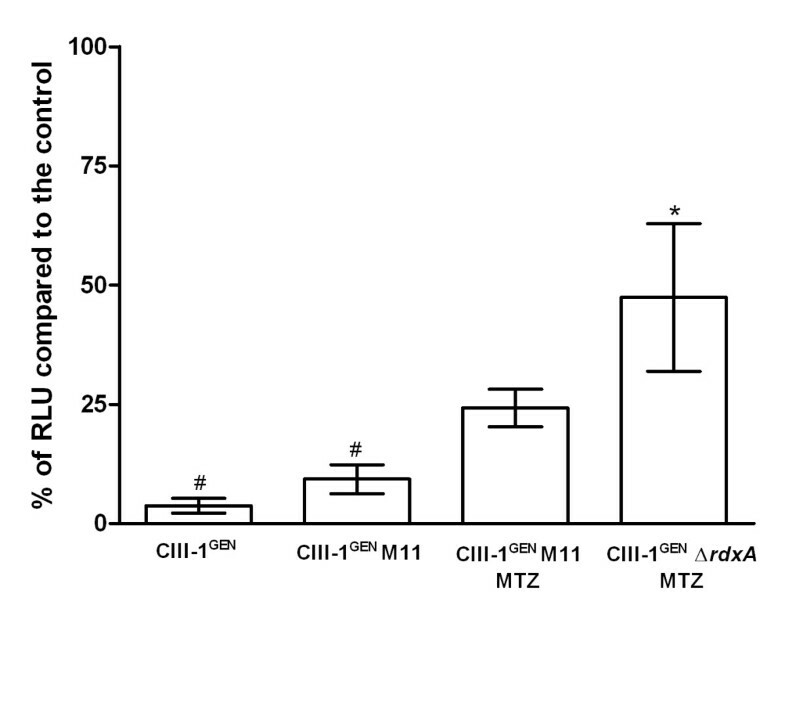 To further explore the role of rdxA in H. bizzozeronii’s resistance to metronidazole, the gene was inactivated using a chloramphenicol cassette in two different strains: CIII-1GEN and CCUG 35545T. Due to the lack of a suitable complementation protocol for H. bizzozeronii, two independent mutants for each strain were selected as a control for secondary mutations. All of the mutants showed eight-fold increased MIC values for metronidazole when compared to the respective parental strain (Table 2). The mutation rate for H. bizzozeronii CIII-1GEN gaining metronidazole resistance was estimated by Luria-Delbrück fluctuation analysis, and the results are presented in Table 3. In the first experiment, the rate was calculated to be 4.78 × 10-6. However, in all of the replicates of the subsequent two experiments the number of mutant colonies was above 300, hampering the estimation of the mutation rate. Thus, in a fourth assay the fraction of plated volume (z) was decreased to 0.02, allowing the determination of a mutation rate of 1.74 × 10-5. The mutation frequencies were estimated to be 4.96 × 10-5 and 2.38 × 10-4 in the first and fourth experiments, respectively. There are 21 independent cultures for each experiment. A luciferase-based bacterial cell viability assay was used to determine the bactericidal effect of metronidazole on H. bizzozeronii strain CIII-1GEN and its derivate CIII-1GEN ΔrdxA and CIII-1GEN M11 after sequential subculture. Time-kill curves were generated to measure the decrease in intracellular ATP after treatment with 1× the MIC of metronidazole (calculated for the mutant H. bizzozeronii CIII-1GEN ΔrdxA). The results are shown in Figure 2, where the data are plotted as a percentage of relative light units (RLU) of the treated samples compared to the untreated ones. In order to minimize the effect on the phenotype of phase variation of loci other than rdxA, CIII-1GEN M11, obtained by pooling several colonies of spontaneous mutants from different plates, was selected. The extension of the SSCR (C8 to C9) in the position 178–180 was the only modification observed in rdxA of CIII-1GEN M11. After 16 h of exposure, the spontaneous metronidazole-resistant isogenic mutant CIII-1GEN M11 maintained on non-selective plates survived similarly to the wild type but significantly less well than CIII-1GEN ΔrdxA. In contrast, when CIII-1GEN M11 was maintained on selective plates, the percentage of survival was not significantly different to any of the other conditions tested. However, in the absence of metronidazole, CIII-1GEN M11 survived less well than the same strain maintained in medium containing the antibiotic. Therefore, although no statistical significance was found between the survival capability of CIII-1GEN M11 when sub-cultivated with or without metronidazole, it tends to become more susceptible in the absence of selection after a small number of in vitro passages. Killing effect of metronidazole (MTZ) after 16 h of exposure against H. bizzozeronii strains. The figure shows the time-kill curve for H. bizzozeronii strains CIII-1GEN, its derivate CIII-1GEN ΔrdxA and CIII-1GEN M11 maintained in the presence or absence of MTZ (marked with MTZ in the figure). Data are plotted as the percentage of intracellular ATP, shown as relative light units (RLU), of the treated samples compared to the untreated ones. Means statistically significant different from the wild type strain CIII-1GEN are indicated with an asterisk, while means statistically significant different from the mutant strain CIII-1GEN ΔrdxA are indicated with a hash tag (Turkey’s HSD, ρ < 0.05). In association with other antibiotics, metronidazole is largely used in the first-line treatment of H. pylori infections, and an increased incidence of resistant strains has been observed in the last few years, with current rates varying from 17% in Europe to 44% in America. In contrast, almost no data are available concerning metronidazole resistance in H. bizzozeronii and other species of the H. heilmannii s.l. (such as H. salomonis and H. felis). The MICs of metronidazole for six H. bizzozeronii strains of animal origin have been estimated (by the agar dilution method) to range from 1 to 8 μg/mL, suggesting that this antibiotic could be efficiently applied to eradicate H. bizzozeronii infections. However, the analysis of isolates obtained from multiple biopsy samples from the same patient[7, 15] revealed the simultaneous presence of metronidazole-susceptible and resistant variants. These data suggest that the isogenic variation of H. bizzozeronii may lead to the accumulation of heteroresistant phenotypes for metronidazole, resulting in treatment failure. Metronidazole resistance is a strong predictor of treatment failure for Helicobacter infections when the treatment contains metronidazole. However, due to insufficient information about the genetic background of the resistant phenotype, non-invasive detection of metronidazole resistance is not yet feasible[16, 26]. Several years of investigation have provided evidence that the main causes of metronidazole resistance in H. pylori are mutations that alter the correct function of the nitroreductases rdxA or frxA. However, this resistance has recently been shown to involve more complex changes than the simple inactivation of rdxA or frxA, including intracellular redox potential and global gene regulation[29, 30]. To investigate possible changes in H. bizzozeronii after the acquisition of metronidazole resistance, a comparative genome analysis of susceptible and resistant isogenic strains has been performed. Numerous single nucleotide polymorphisms (SNPs) and insertions or deletions (Indels) were detected in the metronidazole-resistant strain compared to the isogenic susceptible one, indicating that the modification of several genes could participate in the resistant phenotype. However, among the five nitroreductases identified in the H. bizzozeronii CIII-1GEN genome, only the homolog of H. pylori rdxA was affected in the resistant strain, and its C-terminal cysteine-containing conserved region (IACLXALGK) was disrupted. This mutation resulted from the extension (from C8 to C9) of a simple sequence cytosine repeat (SSCR) located in the 3’ region of the gene. A comparative analysis showed that a similar 3' SSCR is also present in the same position in the rdxA homolog of H. heilmannii s.s. but not in H. pylori. In this study, we showed that the extension of the 3′ SSCR of rdxA was the only mutation detected in the majority of in vitro spontaneous H. bizzozeronii metronidazole resistant mutants. In addition, we observed that an H. bizzozeronii ΔrdxA mutant strain showed the same MIC value of metronidazole that was observed in the spontaneous mutants. These data indicate that loss of function mutations in rdxA, and, in particular, the disruption of the conserved region IACLXALGK, are sufficient to produce clinically significant resistance to metronidazole in H. bizzozeronii. These findings extend our knowledge of the types of mutations that affect the functionality of rdxA in Helicobacter spp., and they support the idea that the C-terminal cysteine-containing conserved region plays a critical role in the ability of RdxA to catalyze nitroreduction. Moreover, slipped-strand mispairing of the rdxA 3′SSCR appears to be the most frequent mechanism leading to the inhibition of the H. bizzozeronii metronidazole-nitroreductase activity. Therefore, H. bizzozeronii rdxA represents the first example of a contingency gene being associated with metronidazole resistance. Simple sequence repeats in Helicobacter and other bacterial genomes can mediate phase variation due to their high mutation rates and reversible mutations, providing a population-based mechanism for stochastic variation in expression of specific genes and rapid adaptation to environmental fluctuations[20, 32]. In this study, we demonstrated that H. bizzozeronii acquires resistance to metronidazole at a mutation rate similar to that described for phase-variable genes in Campylobacter jejuni and other bacterial species. In addition, we observed an increased level of susceptibility to metronidazole in a spontaneous mutant maintained in non-selective conditions after approximately 15 passages, indicating that the resistant phenotype is reversible. Based on these data, it is tempting to speculate that metronidazole resistance in H. bizzozeronii is a phase-variable phenotype due to the contingency nature of rdxA. However, several other unknown mechanisms could lead to metronidazole resistance in H. bizzozeronii, overcoming the stochastic variation. In addition, it is not clear how frequently the reversion of the mutation (C9 to C8) occurs. In fact, we recently detected that the larger fraction of the H. bizzozeronii population colonizing the stomach of a patient maintained the C9 allele in rdxA six months after the end of the therapy. Although it is clear that disruption of the C-terminal cysteine conserved region of rdxA decreases the ability of H. bizzozeronii to catalyze the metronidazole nitroreduction, the effect of this mutation on NAD(P)H-oxidase activity is unknown. Therefore, it may be possible that the same mutation that provides resistance to metronidazole does not alter the physiological activity of rdxA, or paradoxically, induces an increased fitness of the bacterium. This could lead to the fixation of the mutation in the population, as observed in the patient. In conclusion, H. bizzozeronii, and potentially other species of H. heilmannii s.l., easily acquired clinically significant resistance to metronidazole due to the high mutation rate of SSCR located in the 3′ region of rdxA. Although we observed in vitro reversibility of the phenotype, there is evidence that the mutation can be maintained in vivo even six months after the end of therapy. Therefore, the contingency nature of rdxA should be carefully considered when metronidazole is used in the treatment of H. heilmannii-associated gastritis in humans. This study was funded by Academy of Finland FCoE MiFoSa, no. 11411405, and Academy of Finland Postdoctoral Fellowship no. 132940. PKK performed the experiments and helped to draft the manuscript. CP constructed the rdxA::cat mutants. JR participated in the design of the study and helped to draft the manuscript. MLH participated in the design of the study and helped to draft the manuscript. MR conceived and coordinated the study, designed the experiments and drafted the manuscript. All authors read and approved the final manuscript.